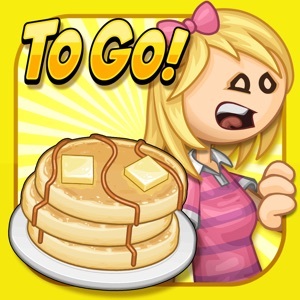 App Report for Papa's Pancakeria To Go! Serve breakfast on the go in Papa's Pancakeria To Go! -- ABOUT THE GAME -- While hunting for your lost pet, you suddenly get a call from Papa Louie with some good news: Your pet was found at Papa's Pancakeria in Maple Mountain, and since your pet likes the restaurant so much, Papa Louie decided to let you run the Pancakeria while he's away! You'll be busy multitasking as your customers order fluffy pancakes, golden waffles, warm french toast, and delicious drinks through all seasons of the year. Pour batter onto the griddle, add mixables to the batter, and keep checking back to flip the flapjacks halfway through. Stack their plates high with pancakes, syrups, and toppings that change with each holiday. Add a hot mug of coffee or a refreshing glass of juice to complete the breakfast, and serve the food to your hungry customers. Customers can also place orders by phone, so hire a driver to deliver a hot breakfast right to their doors! 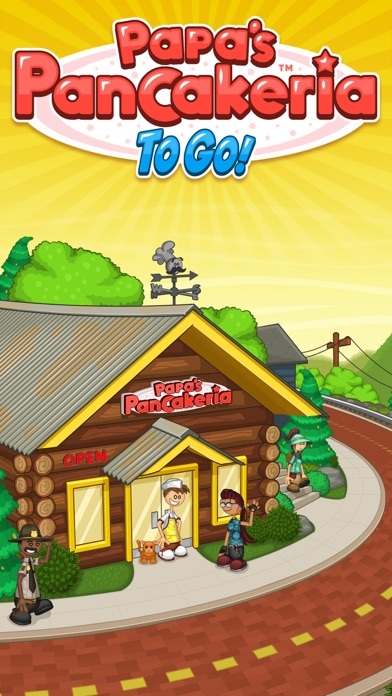 -- GAME FEATURES -- NEW FEATURES - All of your favorite features from other versions of Papa's restaurants are now available in this "To Go" game, redesigned and reimagined for smaller screens! HOLIDAY FLAVORS - Celebrate the seasons with new holiday flavors! As the seasons change in Maple Mountain, your customers will order their pancakes, waffles, and french toast with new seasonal ingredients. You'll unlock new syrups, toppings, and drinks for each holiday of the year, and your customers will love trying new flavors for a festive breakfast. 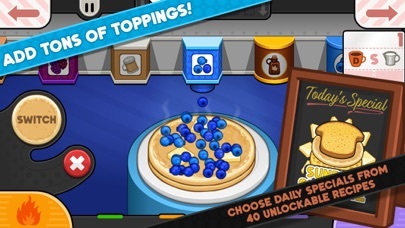 SERVE SPECIAL RECIPES - Earn Special Recipes from your customers, and serve them as the Daily Special in the Pancakeria! Each Special has a bonus you can earn for serving a prime example of that recipe. Master each special to earn a special prize! CUSTOMIZE YOUR WORKERS AND PET - Play as Cooper hunting for his lost cat Cookie, or Prudence with her lovable dog Pickle -- or create your own custom character along with your own pet! You can also show off your holiday spirit with a massive variety of holiday outfits and clothing for your workers. Choose unique color combinations for each item of clothing, and create your own style with millions of combinations! SPECIAL DELIVERY - When you start taking phone orders, customers can call to place their breakfast order, and you'll hire a Driver to help you take and deliver orders to their homes! COLLECT STICKERS - Complete a variety of tasks and achievements while playing to earn colorful Stickers for your collection. Each customer has a set of three favorite Stickers: Earn all three and you'll be rewarded with a brand-new outfit to give to that customer! 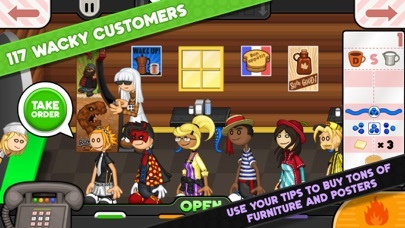 DECORATE THE SHOP - Customize the Pancakeria lobby with themed furniture and decorations for each holiday of the year! Mix and match your favorite styles, or add items that match the current holiday so customers won't mind waiting longer for their food. CLIPPING COUPONS - Missing your favorite customer? Send them a coupon with the help of your friendly mailman, Vincent! Customers love a good deal, and will promptly arrive to order another meal. Coupons are great for completing quests for Stickers and for strategically leveling up customers! 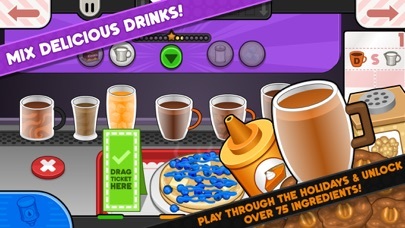 DAILY MINI-GAMES - Play Foodini's famous Mini-Games after each workday to earn new furniture for your lobby and new clothing for your workers. 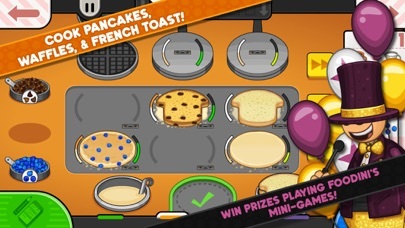 -- MORE FEATURES -- Hands-on pancake shop in the Papa Louie universe All new controls and gameplay features designed for smaller screens Multi-task between cooking, building, and serving drinks Custom chefs, drivers, and PETS! 12 separate holidays to unlock, each with more ingredients Earn and master 40 unique Special Recipes 90 colorful Stickers to earn for completing tasks 117 customers to serve with unique orders Use Stickers to unlock new outfits for your customers Over 75 ingredients to unlock ** NOTE FOR iPAD USERS ** Papa's Pancakeria To Go is designed especially for smaller screens, look for Papa's Pancakeria HD for tablets! Category Ranking Trends for Papa's Pancakeria To Go!